Candida albicans is a yeast naturally occurring in your intestinal tract that can proliferate when its competition for resources is eliminated and it experiences favorable conditions for growth. Diets that purport to combat candida overgrowth are available online, and many books have been written on the topic. Most of these diets have a number of components in common, and one of those common factors is the consumption of a few varieties of nuts, including almonds, to discourage candida. The Yeast Connection is a program designed by Dr. William Crook, who attributes many chronic health conditions to candida overgrowth. Dr. Lawrence Wilson, director of the Holistic Center for Development in Prescott, Arizona, says that dietary changes are imperative to starving out the excess candida and restoring a more normal balance of gut flora. He states a concern that some practitioners attribute too many disorders to candida overgrowth, but he himself names many diverse possible symptoms, such as chronic fatigue, depression and headaches as possibly caused or exacerbated by yeast overgrowth. He also cites it as a possible contributing factor in mood swings, joint pain, sinus problems and cancer, as well as several other illnesses and symptoms. 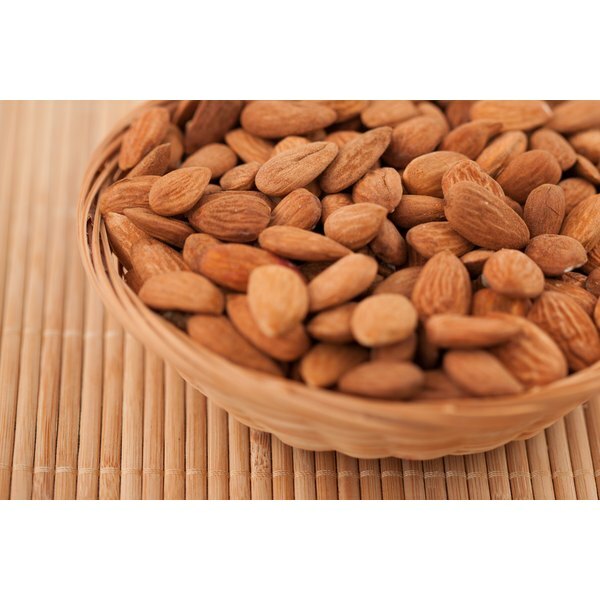 The dietary changes recommended by these and other practitioners to reduce candida include almonds as a food that is helpful. Candida diets are designed to discourage the growth of candida albicans by essentially removing its primary food source, which is sugar. In addition, candida thrives in a more acidic environment, so several of the diets encourage removal of foods that contribute to an acidic internal environment and instead foster a more alkaline, or basic, habitat. Almonds fit both criteria, as they are slightly alkaline and do not contain sugar. According to Crook, acceptable nuts to eat in addition to almonds include Brazil nuts, cashews, filberts and pecans, but Donna Gates, author of "The Body Ecology Diet", suggests avoidance of all nuts with the sole exception of almonds. She does recommend soaking and sprouting almonds before eating them to help remove an enzyme-inhibiting substance contained in their brown, papery coating. She points out that almonds, in addition to contributing to a more alkaline internal environment, are also a good source of plant-based protein and several vitamins and minerals. While foods themselves are either acidic or alkaline in nature, due to reactions after digestion, they may have either an acidic or alkaline effect on your body, and the effect is not always what you would expect. For example, you can taste that lemons are quite acidic, but after digestion they have an alkalizing effect in your body. Almonds are mildly alkaline and also have an alkalizing effect for your internal environment, according to Gates. In order to soak and sprout almonds at home, cover raw almonds with purified water in a glass or stainless steel container for eight to 12 hours. Drain out the water, and turn the container upside-down and let them sit for another eight hours. At this point, you can either refrigerate or dehydrate the almonds, but leaving them out to sprout for much longer than recommended can result in a slightly bitter flavor. What Is the Cheapest & Best Way to Get Omega 3?